1. What Topps projetcs have you currently been working on? I did the backs for the All-New Series 5 GPK set, and a few roughs for the fronts... and roughs for the 'alphabet stickers'. And right now, I'm working on some roughs for some top-secret new series ideas, which may, or may not come out. 2. How many concept pieces (per project) did you have completed for the release(s)? did you once again work on the backs for both Garbage Pail Kids and Wacky Packages sets? I didn't do anything for the All-New Series 3 Wacky Packages set, I don't think... Unless Topps used some gags I submitted for Series 1 or Series 2 that they didn't use in those two previous sets. I haven't seen the Wacky Packages Series 3 set yet. Topps doesn't send me this stuff. Dave Gross did most of the All-New Series 3 Wacky's, and Neil Camera did the backs. I've been too busy with the All-New Seres 5 GPK to do anything for the All-New Series 3 Wacky Packages set. On Series 5 GPK, I did 70 or 80 roughs. 24 for the backs... 30 alphabet stickers... and the rest would be roughs for the fronts. I won't know what they used for sure until I see the printed product. 3. What did you think of the Sketch cards commemorating the 20th Garbage Pail Kids annivarsary for the All-New Series 4 GPK set? That's 20 sets in twenty years you've worked on them. I don't know what to think of the 'sketch cards'. I enjoyed getting paid, that's for sure. I did 2 or 3 thousand of them. It was kind of mindless work... drawing the same thing over and over. But I enjoyed the money. In order to make it profitable I did something like 6 images and repeated them 500 times each, or something like that. I figured it out... I had to do one card a minute to make it worthwhile. I used a crow-quill pen, which allows one to draw fast. I thought they came out okay. Serious collectors might like them... but I don't think the average ten-year-old thinks of these cards as 'drawings'. I don't think a kid thinks of them as something that someone drew. They just take them at face value... an ugly kid with a goofy name and a funny gag. They don't think anyone actually DREW these pictures. so I dont' think the 'sketch cards' were something that would be a real selling point with a mass audience of actual kids... who buy the cards for their entertainment value. I think the real audience, the kid audience, will be more amused by the 'alphabet sticker' cards... where they can use these ABC stickers to spell out rude words on public walls and stuff. 4. How does working on Garbage Pail Kids now differ from twenty years ago? Technique/freedom? The GPK are gone over with a fine-tooth comb for political correctnes now-a-days. There is also a general thought at Topps that kids know nothing of the mass culture except for the media that is aimed directly at kids. So in the old days, we could make jokes about the adult culture as well as the kid's culture. One of the old fake premiums on the backs of the cards in the 80's was these eyeglasses that the kid would supposedly send in 5,000 GPk wrappers and $500 for (editor's note: comic back for 8th Series cards 294A and 294B)... they were eyeglasses that had spikes in them, so that when a person put them on they would poke out their eyes. We called them 'Oedipus Spex'. A gag like that would never pass the Topps execs today. Not so much for the eye injury aspect, but because someone along the line at Topps would say "Kids don't know who Oedipus is, change it to Sponge Bob". In the old days, we could educate kids. Now we just seem to condescend to some notion of the idea that kids only know the kids media... which kind of cramps the style of the humor. But this is usually the case with every successful satire product throughout history. Once it starts to make money, it starts to aim at a wider audience which inevitably waters-down the humor. 5. 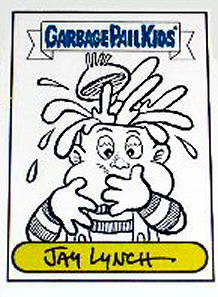 What is your favorite Garbage Pail Kids that you drew in the eighties? Concept/final? 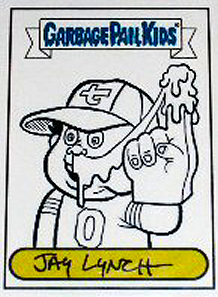 I don't know what my favorite GPK that I did the rough for in the 80's was... 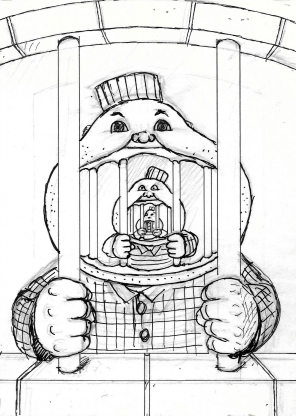 I guess the prisoner kid... where there is a smaller prisoner behind bars inside his mouth. I called it 'Jailhouse RICK' on the rough, but the name was changed to something else when they released it (editor's note: 9th Series 343a Con VIC and 343b AL Catraz). 6. 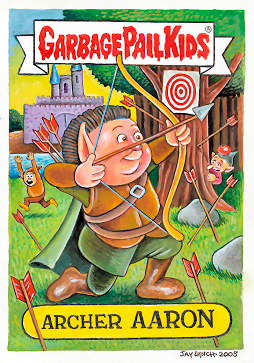 Do you have a favorite Garbage Pail Kid for the All-New Series releases? 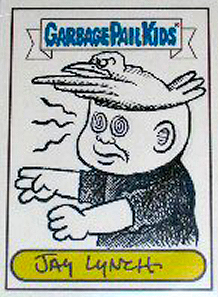 My favorite GPK of all time that I did was Birdbrain BRIAN (editor's note: ANS3 20a and 20b Cuckoo CHRIS). This is from one of the All-New Series sets. That one has a moral to it: "Don't let anyone brainwash you kids! If you do, you're a sap!". That's the meaning of the card... don't tell Topps, though. 7. With the recent success of both of Topps GPK humor and WP parody sets, and the 80's nostalgia being so popular again, any hopes that Topps will come out with another humor or parody set? Like another Trash Can Trolls set? Or like the Dark Horse's Meanie Babies parody set? Topps is always trying to develop new parody and humor sets. They might be a little more cautious now, as they haven't done as many original sets in recent decades as they did in the 60's or 70's, but it seems a good climate for a new set now... with the success of the new GPK and Wacky's and all. 8. How was it working on the non-Topps Meanie Babies parody set with John Pound? The writing on the backs were very humorous, especially the Top Cow's GUFF! comic. I still have the roughs for the GUFF! Meanie Babies story. Pound created all the characters for the Meanie Babies. I just wrote the poems for the backs. 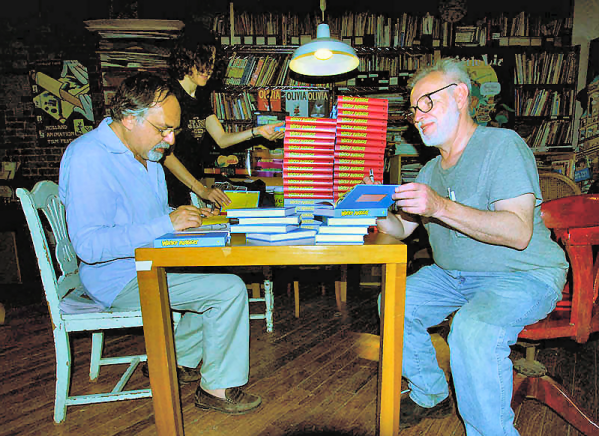 I wrote 2 poems for each back, and David Scroggy, an editor at Dark Horse, picked the poem that he considered the better of the two for each back, and that's what they printed... it was a pretty easy gig. 9. Where else can we find Lynch art? And what other personal projects have you recently been, or will be working on? I started to do an autobiographical comic... three stories from it are posted at www.topshelfcomics.com. I don't know if I'll ever finish it though. This type of stuff pays very little... and I rarely have time to work on it. I wrote these yarns and did roughs and Ed Piskor drew them. I also do some dangerious stuff... but this is the stuff I like best... if you go to www.corporatecampaign.org and check out the 'current' campaigns... check out Coca Cola and The Airline Mechanics Union stuff... I did all the paintings and drawings and lots of ideas for these campaigns... but I didn't sign any of the Coke stuff, since I dont' want to get killed! I mean, this stuff REALLY fights the "Man". The trading card stuff is subtle satire... but the Corporate Campaign stuff tells it like it is. King of like Wacky Packs with sharp teeth. 10. What other Topps projects, besides GPK and WP, have you worked on in the past? I've worked on tons of Topps projects over the years. I wrote the Goosebumps trivia questions sticker album... I've never seen a printed copy, though. Topps doesn't send me this stuff. I wrote the copy for Precious Puppies... I did the Batman sticker album... Smurfs cards... Funny Little Joke Books... Tattoons... Bathroom Buddies... Travel Posters... On Board Signs... those Marvel character stickers in the 70's... I designed candy products like Paint-Roller Pops... and numerous lollipops and candy dispensers... I did the Bazooka Joe strips in the early 90's... I did the folding valentine posters in the 70's... and I worked on lots of this licensed stuff... like Happy Days cards, Good Times cards... cards from all those old TV shows... I drew the Duckman comic for Topps... I did Ugly Stickers roughs... the list just goes on and on!